Most allergic reactions to cats are caused by the Fel d 1 protein, which is found in a cat’s saliva, sebaceous glands in the skin, and urinary tract. The allergen is usually released into the environment as cat dander (microscopic particles of skin), where it floats around and settles onto various surfaces. The most common allergic reactions to cats (and dogs) are runny noses, sneezing, red itchy eyes, itchy rashes, and breathing problems. However, many other substances can cause these symptoms, so a large number of pets are given up unnecessarily when an incorrect diagnosis of pet allergy is made. Often, when allergy symptoms occur, the culprit is actually pollen, dust, chemicals, dust mites, or even particular foods that the allergy sufferer has eaten. As with animal allergies, a person who did not previously react to these substances may develop a sensitivity. Because there are so many other possibilities, those who believe that they may be allergic to their pets should consult a doctor for allergy testing before they consider giving up their animals. There is actually no such thing as a completely non-allergenic cat. Hypoallergenic means less allergenic, not allergy-free. This means that although many allergy sufferers can tolerate so-called hypoallergenic cats, there will always be a few that react to them. The breeds that are often promoted as hypoallergenic include the Siberian, Russian Blue, Sphynx, and Rex Cats (Cornish, Devon, and Selkirk). 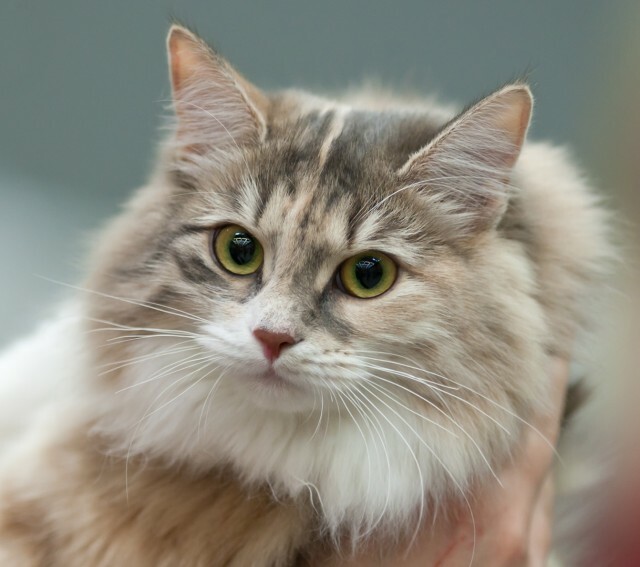 There is some evidence that many Siberian cats produce less of the Fel d 1 protein, and the Russian Blue, which originated in the same region as the Siberian, may also produce less Fel d 1. While this doesn’t make the Siberian or the Russian Blue completely allergen-free, many allergy sufferers can tolerate them better than cats of other breeds. As for the hairless Sphynx and the short-haired Rex cats, they produce a similar amount of the allergen as any other cat, yet some allergy sufferers are able to tolerate them. In the case of the Sphynx, it may be that the breed produces less dander than furry cats, so the allergen protein doesn’t get distributed as excessively. As for Rex cats, their tight curly fur may reduce the amount of dander released into the air. For unknown reasons, some people also seem better able to tolerate Bengal, Siamese, and Burmese cats as well. Which Cats Produce More of the Allergen Protein? Females produce less than males. Neutered males produce less than unfixed males. Cats with light-coloured fur produce less than those of darker colours. Thus, choosing a light-coloured female cat may decrease the likelihood of suffering an allergic reaction, though some individual cats break these rules so there are no guarantees. The best method for obtaining a cat that won’t provoke allergic reactions is to spend as much time as possible with potential adoptees beforehand, as many allergy sufferers find that they can tolerate a particular cat regardless of breed. Will Washing a Cat Reduce Allergen Levels in the Home? Some people believe that bathing their cats regularly will reduce the incidence of allergy attacks. However, studies have shown that the benefits of bathing alone are minimal, probably because although the allergen has been temporarily removed from the cat’s fur, there is still plenty of Fel d 1 floating around the house. Are There Ways to Reduce Allergic Reactions to Cats? Most cat allergies are relatively mild, and there are a number of things that can be done to reduce or eliminate allergy symptoms and the dander that causes them. See Dealing with Cat Allergies for more information. Feldweg, Anna, Dr. (18 December 2006). “The Truth About Cat Allergies.” EverydayHealth.com. Hartwell, Sarah. (2007). “Help! I’m Allergic to the Cat.” MessyBeast.com. Morris, Adrian. (2008). “Aero-Allergen Avoidance Measures – Effective or Futile?” Current Allergy & Clinical Immunology, 21(2), 101-102. How do I get one,OMG,perfect.I think WE would like blue eyes,and either multi colored or beiges. Hope to find one close to me in PR fl,34668 and sure hope We can afford one. We have a kitty, she is two,so would love a male.Our kitty is fixed, so no plans on babies,its just we lost our other kitty of 16 years,and its hard,even though its been over a year ago. Thanks for your time, have a good day. Keep in mind that although the breeds listed in this article are less likely to provoke allergic reactions, some people have reactions to all cats, so it’s important to spend some time with the kitten or cat you plan to adopt to make sure you’re not going to have a reaction. I love cats but my mother is allergic to them. I tried so many times to convince her but it seems that she doesn’t believe hypoallergenic cats do exist. I am showing her this article with a cute picture of a cat loving his/her owner. Thank you for this, my hope is getting a cat. Thanks, and good luck! I hope you get your cat.